It is been over a year since I have returned from Europe and I realised that I haven't yet written about Macbeth. Actually, there are quite a lot of things that I have been meaning to write about, both on this blog and on my travel blog, that I simply haven't got around to doing just yet. I guess a part of it is because there is an awful lot of stuff that I could write about, and also with work and with other things that have got in the way, the amount that I have been able to write has been limited. However, of late I have only intended to post one post a week (and one post a fortnight on my travel blog), and there has been plenty of stuff for me to post that I guess letting a number of things drift isn't all that bad. However, I did see Macbeth, and I should at least put some time aside to write about it. 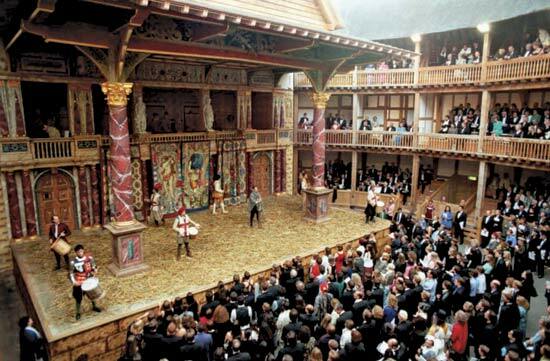 However, before I actually get onto the play itself I probably should say a few things about the venue I saw it in - The Globe. This would be the second time I have seen a play here, though I have discovered that you really do need to book ahead if you want to see the play when you actually want to see it - I would have preferred to see A Midsummer Nights Dream but when I finally got around to booking the tickets (and that was something like three months before I got there), all of the sessions that I wanted to see it at had sold out. However, there were still plenty of tickets for the Scottish Play, which I have to admit actually isn't one of my favourites, but it was at the Globe so I guess I would have to put up with it. Except that The Globe is probably one of the most horrendous places where you can actually see a performance. Sure, you do have standing room, but honestly I really don't want to spend three hours standing on my feet while watching a play, and my brother definitely wasn't all that keen. However you do have seats (which was where the middle and upper class people of the day would sit), however they are the most uncomfortable seats that I have ever sat on. Fortunately you can get cushions for a pound each so that sort of solves that problem. Yet there is another problem, as I discovered, and that is if you get the wrong seat you may just find yourself staring at a pillar for the entire night, as happened to me. Fortunately there was some space either side so I did end up being able to see the play. 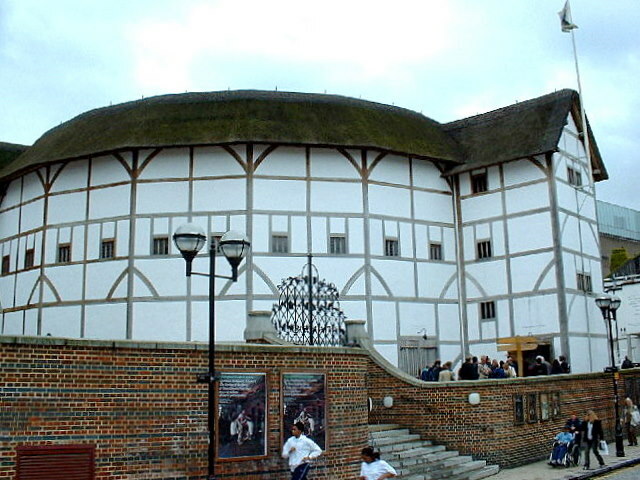 However, we they describe a position as being restricted view at the Globe, take their word for it - it can be incredibly restricted. One of the things that stands out with the globe is that they always use traditional clothing, or at least the plays that I have seen performed there have done so (and I have only seen two, though I have also seen a couple of others in the cinemas with the 'Globe on Screen' productions). The other interesting thing that they do is use puppets - this was the case with Dr Faustus where Lucifer and Helen were both puppets, and the same was with The Scottish Play - the Wyrd Sisters were giant puppets as opposed to human actors. 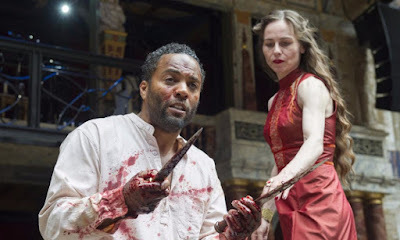 While I haven't seen any other performances of either Macbeth or Dr Faustus, this is a technique that I haven't really seen elsewhere, and I find it quite good because it gives the particular character a much more outerworldly aspect to it. The thing with the Globe though is that it's purpose is the capture the authentic feel of watching a play in Shakespeare's time - to an extent. Sure, the seats are pretty uncomfortable (though you can buy pillows), and there is also standing room, but a part of me suspects that back in Shakespeare's day the smell would have been pretty pugnent, but that has a lot to do with our society being a much cleaner society that the people of Shakespeare's time, though I also suspect that you probably became quite used to the smell. However, despite the theater being pretty uncomfortable, it is still quite popular, as can be attested by the fact that it can be really hard to get tickets to see a play unless you get in pretty early, and also for seats with good views you will certainly being paying a premium price. Anyway, it is probably not necessary for me to run through the plot of the Scottish play because being one of the more popular plays, and also one that is thrashed to death not only in Highschool but also on the stage and screen (I can think of at least four versions of the play that have appeared on the screen including the Michael Fassbender version, the Roman Polanski version, the Throne of Blood by Kurosawa, and a little known Australian version which I call 'Macbeth with Machine Guns'). So, instead of simply repeating something that probably everybody knows I will simply jump straight into talking about a few things that I picked up while watching this particular version, and if you really want a rundown of the plot then you can always go to Wikipedia. 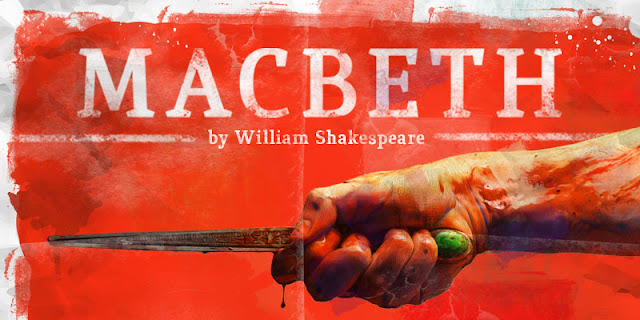 What I might do is look at the two main characters of the play and that is Macbeth and Lady Macbeth, and since Macbeth is the title character I will start with him. Anyway for a while I view the Scottish Play as simply being little more than a Hollywood action movie told from the perspective of the villain instead of the hero. In a sense that is still very much the case because it is clear that Macbeth is the villain, and in a way becomes more and more villainous as the play goes on. However, unlike your typical Hollywood villain, there is actually depth to Macbeth, and in a sense what we are seeing is a character not so much developing, but descending further and further into the pits of despair. In fact one thing that sort of stands out in these works of literature is that there is much more to the villains than simply some guy dressed in black that cackles evilly while twirling his moustache. No, when I come to think of it describing the Scottish Play as simply a Hollywood movie in reverse is probably being a little too simplistic. In reality most Hollywood movies are incredibly shallow (and are becoming moreso) and one thing that Shakespeare isn't, especially when it comes to his characters, is that he is shallow. No, while Shakespeare does have villains in his play, such as Iago, I would say that the characters in Macbeth aren't villains in that sense. Rather it would probably be better to term them as anti-heroes. Antagonists yes, but villains no. So with this in mind let us consider Macbeth. 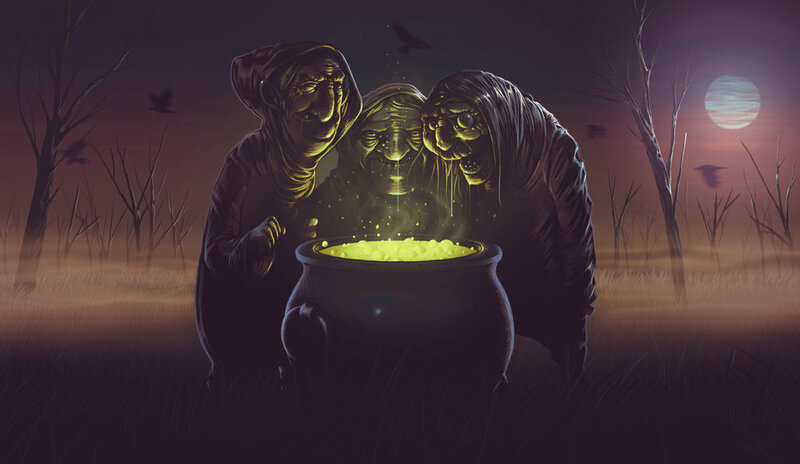 The problem with Macbeth is that he lets himself be swayed by people - first by the Wyrd Sisters and then by his wife. However, what is interesting is that nobody seems to step in and say 'hold it, I really don't think you should go down that road'. Mind you, there probably wasn't much of an opportunity for that to happen because while one might laugh off the Wyrd Sisters, when Macbeth told his wife of the encounter she began to push him to speed up the process by assassinating Duncan when he was asleep in his castle. As a side note I do sort of wonder why it is that everybody was so dull as not of suspect Macbeth of the murder. In a way there was a way out for Macbeth right up until he committed the deed, but once he had committed the deed that was it, the die was cast. It wasn't just a crime, it was a crime of the most hideous proportions - not only did he murder a guest in his house, and the king nonetheless, but he murdered him while he was asleep. Sure, we can put some of the blame on his wife, but the reality is that he did the deed, and because he did the deed he must be responsible for it. What does come about is the nature of sin and how pervasive it is. Sure, as a Christian I believe that there is no sin that Christ's death cannot absolve, but the thing with sin is that it is so pervasive, and so destructive, that it makes us believe that we will never be forgiven for it. Macbeth is cursed, and haunted, and this follows him for the rest of his life. In a sense once he has committed the deed, and pushed from his mind any chance of redemption, he descends further and further into madness until such a time as he meets his fate. Yet let us consider the Wyrd Sisters for a minute. They aren't so much sin, but temptation - they tempt us with promises of power and immortality, but they don't tell us the whole story. They tell Macbeth that he will be king, and they also tell him that he will not be killed by a man of woman born. They tell half truths, and these half truths hide a catch. It is similar to the serpent in the garden that tells Adam and Eve 'but did God really say?'. The thing is that Macbeth not only listened to them, but went to seek advice from the wrong person. I was going to raise the point that Lady Macbeth doesn't actually have a name, but that is not necessarily the case - she does, but since she has married Macbeth she takes Macbeth's name. However, when I think about the monarchs of the era their wives did have names, and names that we know. Also, it isn't as if this was a technique that Shakespeare used in all of his plays because of the other plays that I know, the female characters, particularly the monarchs, all have names. So it is interesting that Lady Macbeth simply takes the name of her husband. Maybe it has something to do with them both being implicated in the crime, or maybe it has something to do with trying to force us to focus more on Macbeth than on her. Yet we simply cannot absolve her of any responsibility - by no means. Okay, she, like the Wyrd Sisters, plays the role of the tempter, but she also does more than simply put the temptation into Macbeth's mind, she goads him on to commit the deed. In one sense she is ambitious, and in another sense completely twists the idea that behind every great man there is an equally great woman. Rather, it is suggested that behind an evil man there could also be a woman who is just as evil - yet this is something that we do not necessarily want to acknowledge - we want to commend the women who support the great men, but when we have a wicked man all we see behind them is Eva Braun. However Shakespeare leaves us in no doubt that Lady Macbeth is not a nice person. In fact she shows her cowardice in that she is more than willing to cut and run than to stand beside Macbeth in his moment of strife. She is ambitious, so ambitious that she is willing to resort to murder to get what she wants. The ambition defines the type of character that she his - manipulative, sly, and when everything goes balls up, decides its time to cut her losses. Sure, she kills herself, but as some have suggested suicide can be the cowards way out, and in the case of Lady Macbeth, as it is in the case of Hilter, this is something that I am not going to argue about. Let us also consider the famous line 'Out, Out Damn spot'. Like Macbeth's curse of never being able to sleep again because he killed a man in his sleep, Lady Macbeth's hands will never be clean again. She has blood on her hands, and the thing with blood is that it stains, but the stains are so strong, and go so deep, that no amount of scrubbing will every get it out again. Yet Macbeth even comments on the amount of blood that came out of the king, and this is a warrior that has just come back from war - you would expect that he would have killed many men in his adventures, so it is interesting that he takes note of the immense amount of blood that comes from the king. One thing that seems to always come up when we talk about The Scottish Play and that is how it is basically a propaganda piece. Actually, it wasn't something that I really thought about until I saw a documentary once called 'The Real Macbeth', that actually took us back into the mists of history to see the story upon which the play was based. The thing was that James, who was King of England at the time, was a Scottish king, and the story of Macbeth was something with which he would have been familiar. The other thing that is interesting is how at the end of the play we have McDuff invade Scotland with the help of the English, and also with their help overthrow Macbeth and install him as king. The story goes that there are two types of Scot - the highlanders and the lowlanders, and there was no real love lost between them. James was a lowlander, but then again pretty much all of the Kings of Scotland were lowlanders. The reason for this was that Macbeth was the last of the Highlander Kings, and what was actually going on at the time was a struggle between the highlanders and the lowlanders over who would end up ruling Scotland. We all know who won, but it is also interesting to note that even to this day the image of the Highlander brings about the picture of a wild and savage man, where as the lowlanders are seen as being refined and sophisticated individuals. Great point about villains in Shakespeare. Even Iago is complex - and chillingly close to each of our darkest selves. I would also mention Richard III as more obviously villainous than the average character. The whole anti-hero idea dates back to the Greek tragedies, of course. A great man, undone by his fatal "heroic" flaw, often pride or hubris. 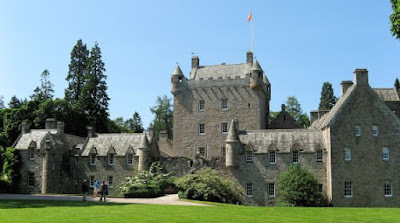 I couldn't help but think of Sir Walter Scott in connection with the Highlander/Lowlander thing. Sir Walter followed the stereotype to a degree, but his own sympathies were pretty clearly with the highlanders. So they are "savage" yet the more noble and admirable characters in many cases. Thanks for the advice regarding the Globe, should my wife and I end up in London one of these years. It would definitely be a highlight to see something there, despite the discomfort.